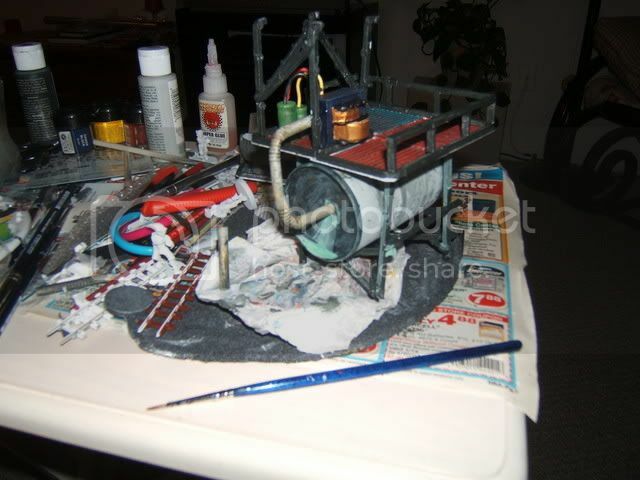 Here is a piece of terrain that I made for Necromunda, though it does see action in 40k as well. It is bascially a water storage tank, with a funnel on the top to catch condensation, that leads to a filter on the second level. 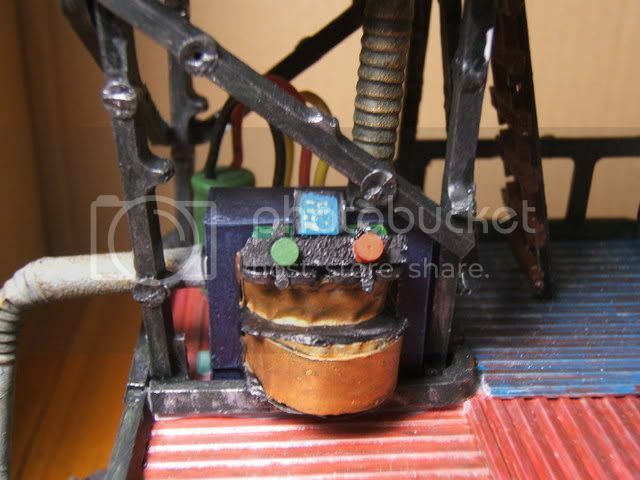 Once "purified" the water enters the tank for later use, and can be pumped out the front, into those 55 gallon drums. 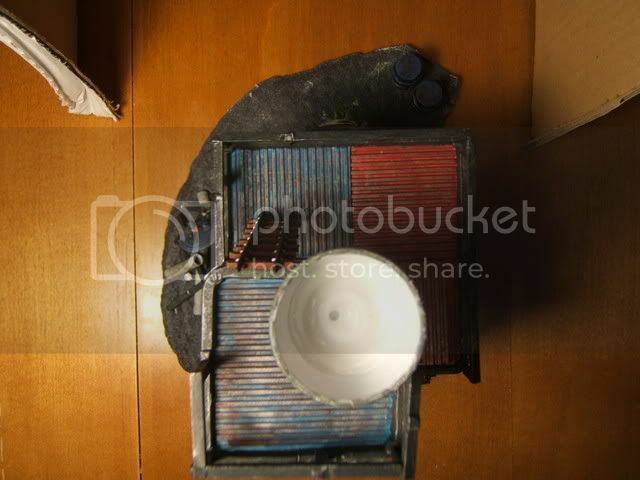 The base is made from styrofoam that came with frozen meat. 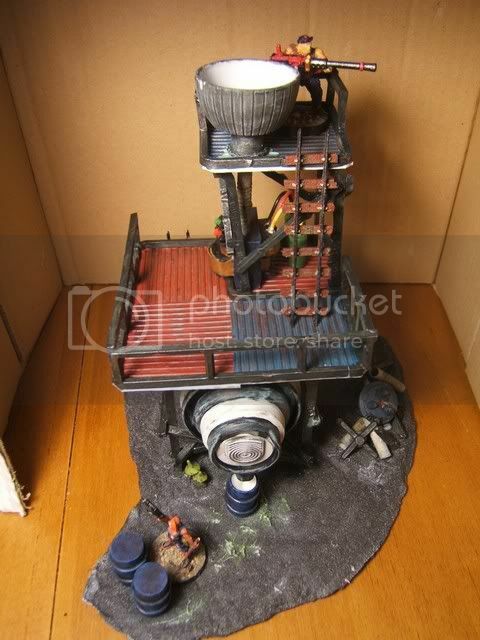 The structure is entirely made of cut up sprues. The water tank is a trial size can of shaving cream. The flooring is made of corregated plasticard, and the funnel is the bottome piece of deodorant that you turn to dispense the deodorant. I hope you enjoy it, and that it gives you all ideas or inspiration for your projects. This first picture shows the beginning phase of construction. I actually didn&#39;t take a lot of pictures of the construction process, sorry. If you have any questions as to how I made anything in particular let me know, and I&#39;ll be happy to share. So, the rest of these pictures are the finished product from various angles. Now a few close up shots. 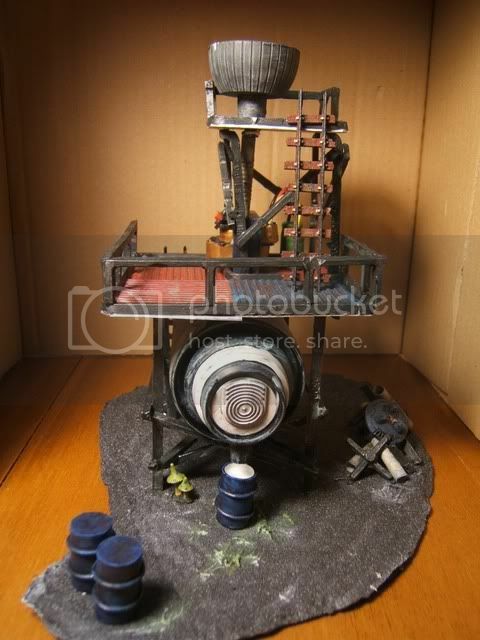 The first is the water filtration computer, which is made from a piece of sprue and something I got out of a computer tower. 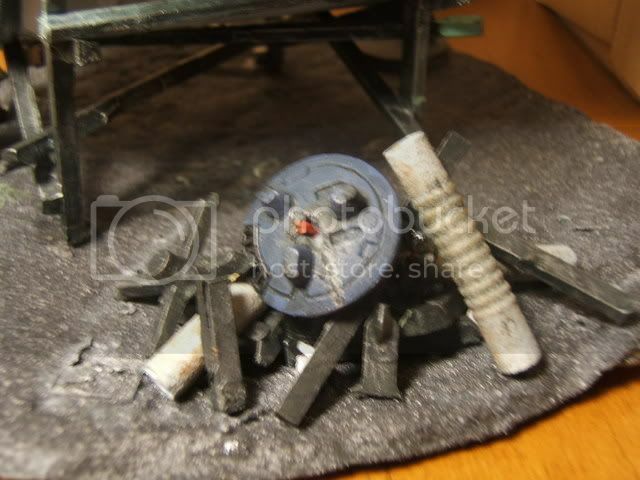 The second picture is a pile of rubble, used for cover, that is also made from sprues, straws, and a trashed Tau drone. It was intended to look like the left over pieces from the construction of the tower. Lastly the barrrels and a little fugus growing in the shade. The barrels are plasticard tubing that I cut to size and then wrapped very thin plasticard strips around. I&#39;ve seen this in real life. It looks awesome. It&#39;s fun terrain too. Do not question who waits for you in the shadow. And my body that crouches in the shadow. That dances to my tune. I can&#39;t see them while I&#39;m at work, because they block photbucket. That might be your problem. 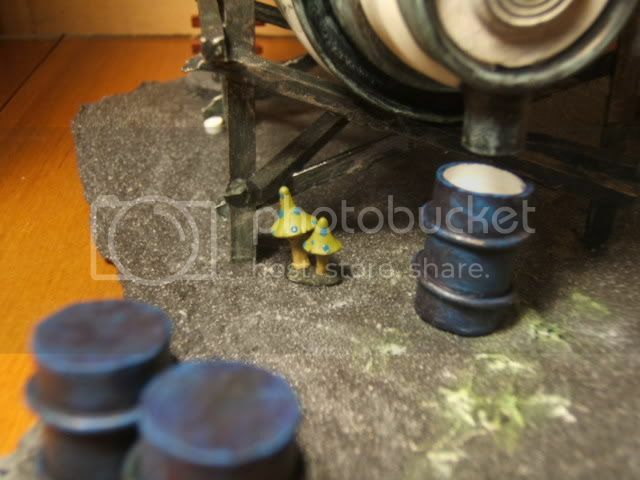 Question Scoutfox: what did you use to make the oil barrels? Is this yet painted? If so, some parts looks like it should be more natural and darker colors. Its very bright right now. Good strcute anyway. 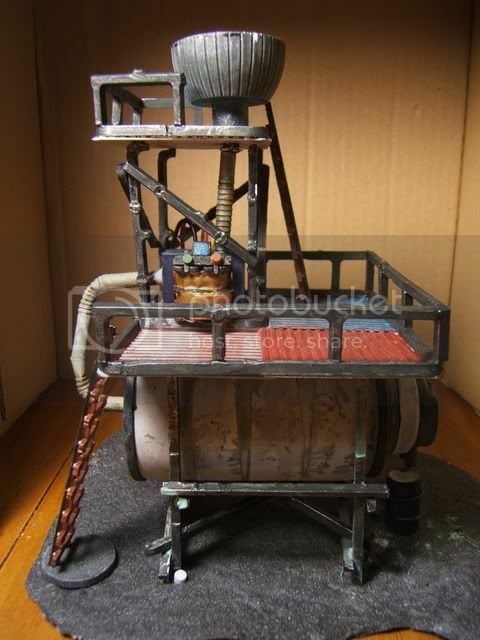 The barrels are made from plasticard tubing, of roughly a 1/4" diameter. Then I curled some plasticard rod around the tube. And yes, it is painted, but the flash makes it appear brighter than it really is. There are probably 2-3 coats of dark ink all over the model. I really do like it... 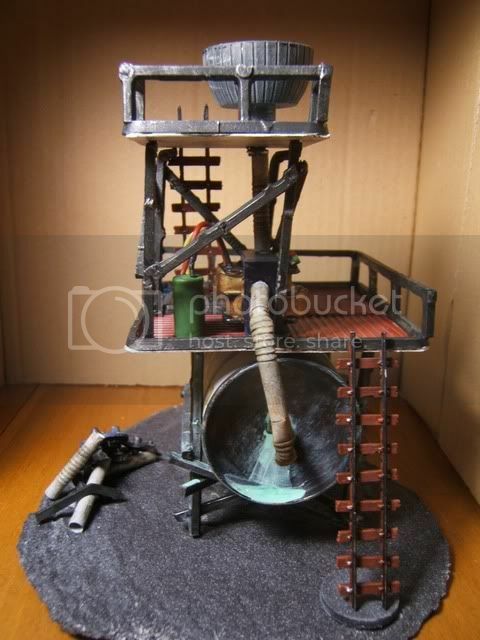 Very necromunda styled and a great terrain peice. 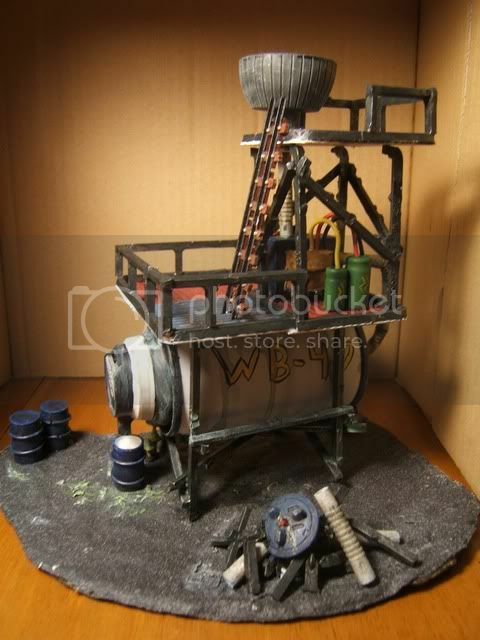 It looks very good and Necromunda-y. My only suggestion would be to find a way to remove or file away the finger grip on the spray can, as it makes it too easy to tell it&#39;s a spray can.